Christopher Columbus had a lot of misconceptions about where he wound up in 1492 and what he saw. Mermaids were listed in one of his journal accounts. But to Chris’ credit mermaids had been around in literature basically since the beginning of literature. The name Sirenia (the order manatees are found in) is in reference to the “sirens” of Greek Mythology. I guess being on a boat in the ocean for a long time can play tricks with your mind but making an alluring beauty out of a lumbering sea cow could mean you’ve been at sea too long. Now that’s not to say manatees aren’t cute, especially in their natural environment. These aquatic behemoths can grow to more than 10 feet in length and weigh more than 1,200 pounds. They have two short forelimbs or flippers with three or four large “fingernails” at the tips. The large head has a wrinkled face with prehensile lips used to grasp and rip aquatic vegetation. Their skin is gray but it is quite often covered with a combination of algae and barnacles. They have no incisors just a row of six molars/premolars in each cheek known as “marching molars” because they are continually replaced throughout the manatees lifetime. Fossil records exist of manatees from 50 million years ago. Their closest living relative is the elephant. We got a personal up-close look at these gentle aquatic giants in Crystal River’s Kings Bay. Instead of throwing away copious amounts of multi colored paper hiding various fanciful objects that may or may not have been “just what I wanted for Christmas” we opted for a Christmas trip. We scheduled a semi-private tour with Plantation Dive Shop. I read that manatees were basically crepuscular creatures so I scheduled an early morning excursion. We arrived at Plantation Dive Shop at 6 a.m. and after squeezing into 5 mm wetsuits and watching an important video about manatees and manatee etiquette we were on the boat with Captain Brian and Captain Thaisy (pronounced Ty-cee.) Captain Brian skippered the boat and Thaisy was our guide and “GoPro” videographer. Both were extremely knowledgeable, gracious and helpful. The Florida manatee is a subspecies of the West Indian manatee. It is endangered and its survival is still in question. Loss of habitat is the number one cause of population decline. Other causes of mortality include algae blooms that contaminate the sea grass they consume, ingestion of fishhooks, monofilament fishing line and other human-caused debris plus boat collisions. In an effort to save these unique creatures the U.S. Fish and Wildlife created the Kings Bay manatee refuge in 2010. 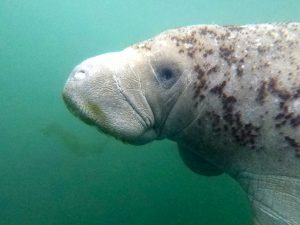 Kings Bay joined a network of 11 sanctuaries and 13 refuges across the state of Florida where waterborne activities can be regulated to protect manatees. The video I mentioned above was eye opening regarding the abuse these placid animals receive from humans. Video showed people prodding manatees with sticks and/or poles, kicking them and surrounding them to impede their progress plus more. I understand concerns environmentalist and/or conservationist will have about the practice of snorkeling with endangered manatees. I have a little experience with animals in the wild – catching and tagging alligators for a summer at Rockefeller Refuge and catching and tagging snow geese and white-fronted geese at Lacassine Refuge. I know how wild animals behave when they feel afraid and/or threatened. The guides at Plantation Dive Shop review what the video teaches about “passive viewing” of manatees – they demonstrate it – and they are in the water with guest to ensure everyone is following proper etiquette. And the manatees, which have no natural predators, are curious and will approach swimmers to try and figure them out. They will get in your face, bump or rub against you or simply ignore you depending on their mood at the time. You are taught how to recognize when they are resting or feeding and how to give them plenty of space and solitude when they are. And there are large areas near the springs in Kings Bay that are totally off limits to humans. Manatees can not live in water below 68 degrees Fahrenheit. In winter Florida Manatees seek out fresh water springs where the water is a constant 72 degrees year round. Kings Bay has several springs and is an important Florida manatee wintering ground. I believe reputable, conscientious tour companies like Plantation Dive Shop can help protect the Florida Manatee. They teach people appreciation of these gentle, inquisitive aquatic giants. The revenue they generate helps agencies better protect the animals plus shows the powers that be – that the public (you and me) care about theses creatures and want our grandkids and their grandkids to be able to see them.